Laugh as this two-time cancer survivor speaker (Prostate and Thyroid) speaks on Medical Records! IrishmanSpeaks Conor Cunneen – is a Chicago Humorous Speaker of the Year! CONTACT Conor who has survived Thyroid Cancer and Prostate Cancer. “I’m not going for the hat-trick,” he says! Conor Cunneen is an Irishman happily exiled in Naperville where he says the natives are friendly, the Guinness is good and he has been force-fed more corned beef than he ever had in Ireland. This motivational Irish healthcare speaker has a humorous outlook on life. A two-time cancer survivor (note, he says two-time, NOT two-timing) he has experienced the trauma of hearing, “You have thyroid cancer” and “You have prostate cancer.” When you this speaker’s response to two cancer episodes “Having had thyroidectomy and a prostatectomy, I now have a unique Irish condition known as ‘There’s not much left-o-me,’ you will appreciate that he is the perfect humorous, motivational speaker for cancer and oncology events, National Cancer Survivors Day and any event where you wish to appreciate cancer survivors and caregivers. Prior to realizing his dream as a keynote speaker for healthcare and other industries, he was Foodservice VP Marketing Unilever and has worked in Ireland, UK and USA. Conor Cunneen is a two-time cancer survivor and a Healthcare Speaker with a brogue! Cancer is not funny, but this Chicago based Irish keynote speaker (healthcare, cancer, oncology) has developed an inspirational, fun-packed keynote speech about his cancer experience. It is probably only a man from County Cork, Ireland (and with the brogue to prove it) who could develop a keynote titled “It’s Just a Flesh Wound” about the experience of prostate cancer. 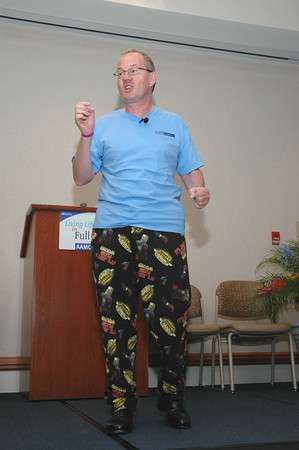 See PR release from this humorous and motivational healthcare speaker who finds humor in most situations. Prostate cancer survivor and speaker Conor Cunneen on his experience: “There are a number of treatment options available ranging from radiation to prostatectomy, in other words the removal of the prostate,” he says in his light lyrical brogue. Prostate cancer develops slowly (normally) which gave this inspirational humorous healthcare speaker (on cancer, marketing, pharma) time to consider his options. Conor is available to present as Keynote Speaker for your National Cancer Survivors Day where he will Energize, Educate and Entertain your audience on how he won his battle with prostate cancer and thyroid cancer. The National Cancer Institute estimates up to 186,000 men will be diagnosed with prostate cancer this year. While prostate cancer does not have to be life-threatening, almost 30,000 men die from the disease each year. Texas Medicare has has an excellent publication on Medicare for Cancer patients: Click this link for the article. Joe Torre. The basebal legend is a survivor of prostate cancer. Best Cancer Hospitals in the U.S.